In any given year I usually buy at least 1 Moleskine branded diary or planner. In 2009 there was the pocket-sized Moleskine in red which was a week on one page, notes on the other. I used this one when I was a post-grad student which was perfect as the diary/week view keep track of classes and deadlines and the notes page was my to-do and reading list. It acted sort of homework diary. They still sell this popular diary and it can be found on their website here. In 2010 I was drooling over the Colour a month…. and finally bought it when I was in the US in summer of 2010 (but I had to wait until 2011 to use it). In 2011 I had the Moleskine Colour a Month. (yes I bought it 6 months in advance). Unfortunately, my enthusiasm didn’t last as I didn’t have the inclination to carry around multiple planners (as well as my multiple notebooks) and I was frustrated by only thinking about a month at a time and I didn’t have the need for a page per day. However, you cannot deny how beautiful this planner is and if a day per page is what you are looking for you can grab the 2014 one here. 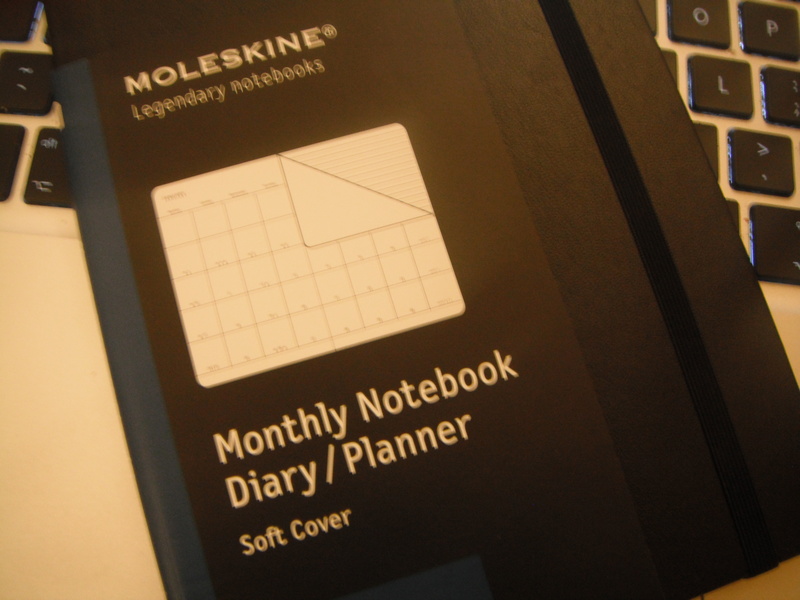 In 2012 there was the Moleskine Monthly Planner which I used as a Blogging Journal / Diary. I used this diary when I was trying to get revamp my blog and get it back on track. That year I also took part in the A to Z Challenge in April and the planner was a great help with that and even featured in my B is for… Blogging post. You can grab the 2014 Monthly Planner (Large) here. In 2013 I had two. A small pocket Monthly Planner and the 2013-2014 Turntable Planner. I really never got to grips with the turntable style of planner and never used it. However, I did enjoy the lightweight (and smaller) Monthly Planner. I had originally bought it because there was no large Monthly Planners left – however I found that I didn’t miss the extra space and it was much more portable. Pocket 2014 one available here. So what might I choose for 2014? Well there are a new collection of professional diaries which I have not seen or used yet – so I might be tempted to try something completely new. There is the Project Planner which is an accordion folder year planner in a moleskine – although as my work is not really ‘project based’ I would fear that it would go unused and the Action Planner may be a better choice with week on two pages in columns which reminds me of my a5 filofax week on two pages column format inserts which I love – so I know I would use it. My only concern is that it is described as extra large – and I don’t really have the need for yet another desk diary. The alternative would be to consider a 12 month Passion Planner but none of the ‘passions’ really match up with what I want to do in 2014 (and I wasn’t a fan of the Passion Journals). So once again I think the choice will have to be my favourite – the monthly planner.